Home » NOBODY’S MAKING ANY MONEY! WHAT’S GOING ON? There are countless reasons for the market sell-off. Some of the culprits for the overall negative sentiment include: worries about a worsening trade dispute with China, slowing global growth, rising interest rates and falling energy prices. In October, Chairman Jerome Powell of the U.S. Federal Reserve Bank said that the Fed is a long way from getting interest rates to a “neutral level”. At Baskin Wealth Management, we believe this was the straw that broke the market’s back. While it appears that interest rates are heading higher because of particularly strong economic growth in the U.S., the worry is that interest rates will rise too far too fast. Many market participants remember the vicious recession of 1981 directly caused by the Fed raising interest rates to record levels in a (successful) effort to stamp out inflation. Sometimes the Fed just overdoes things. The level of interest rates is very important to asset prices. When interest rates rise, it makes riskier assets like stocks, less attractive. Even though interest rates are still quite low by historical standards, the market was spooked by the Fed’s statement that rising interest rates are inevitable. Rising interest rates are not a new phenomenon. Prior to Chairman Powell’s speech in October, interest rates in the U.S. had been raised eight times since 2015. In recent days it has now become likely that interest rates will probably not rise as fast as Powell predicted in early October. The S&P 500 has been in a bull market (a market that rises without a 20% pullback) since 2009, possibly the longest bull market on record. In spite of this impressive run, however, the rise over the past 10 years hasn’t been straight up. In fact over the past 10 years, the S&P 500 has dropped 22 times by at least 5%. Each drop was painful and tough to live through but ultimately, the S&P 500 recovered all its losses and went higher after each of those 22 drops. We are now in the midst of the 23rd drop. 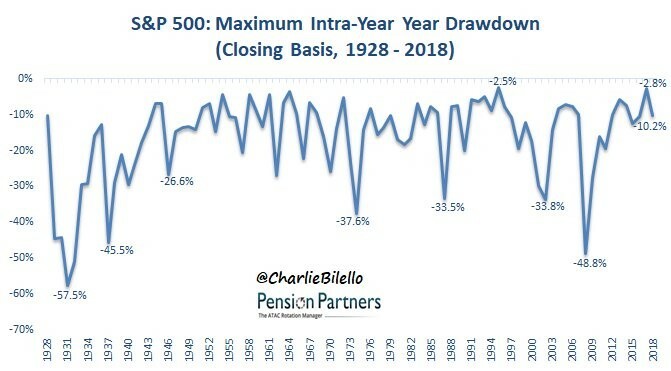 As you can see from the chart below, drawdowns in the S&P 500 are normal and a fact of life for stock market investors. The fact that we didn’t have a material drop in 2017 was abnormal. A bear market is defined as a drop in an index of at least 20% from its previous high point. At the moment, the S&P 500 has fallen just over 10%. While anything is possible, it seems unlikely that we are entering a bear market. First, the economic conditions, especially in the U.S., are very strong. Unemployment is at 50-year lows, U.S. consumer spending has been strong, manufacturing output is expanding, the service sector is expanding and the shipment of goods by all modes of transportation is rising. The only weak spot has been the new house industry. The recent rise in interest rates coupled with tougher regulations for home buyers has hurt demand. Secondly, corporate profits are expanding at an unprecedented pace. Corporate profits are set to rise over 20% in 2018 and many analysts expect another year of double digit increases in 2019. The deep corporate tax cuts in the U.S. have inflated corporate profits and we believe the benefits have only recently begun to filter through to the overall economy. Finally, as a result of these high profits and the recent drop in the market, the valuation of the S&P 500 is at or slightly below its historic average. This makes buying these stocks attractive, given that returns on competing assets like bonds still offer next to no return when adjusting for inflation, even after the increases in interest rates. Over the long term what should matter to investors in common stocks are corporate profits and the level of interest rates. If corporate profits are growing and interest rates are still at low levels, history teaches us those that buy/hold stocks with attractive valuations should be well rewarded. Falling markets are discouraging and disconcerting. It is natural that investors want to protect their portfolios when it seems like the market is going down on a daily basis. Warren Buffett has the best response: “If you wait for the robins, spring will be over.” We are staying the course for clients with a time horizon of at least five years, even if they are drawing a modest amount of liquidity from their portfolio. 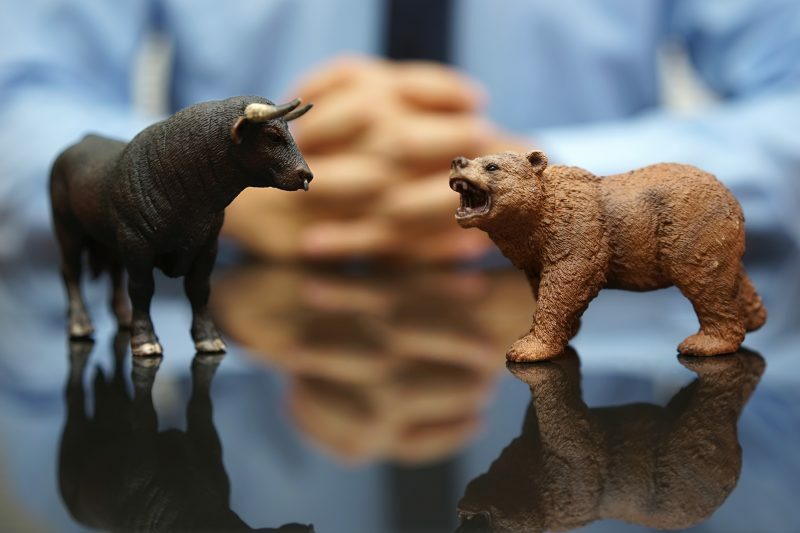 Stock markets are volatile but the pendulum tends not to swing in one direction for too long. At some point, the market will price in all the (perceived) bad news and start to recover. Those who miss the up days by being out of the market suffer. Take a look at the chart below. Over the period from 1996-2016, the S&P 500 index delivered a return of 8.19% a year for those who stayed invested. Now look what happened to those who missed the five best days, the 10 best days, the 20 best days and so on. Our advice is simple and consistent: stay invested. During the recent stock market fall, no industry has received more attention than the high-profile and high-flying technology sector. Many of our clients own shares in technology companies including Apple, Google and Facebook. Until recently, these have been excellent investments for their portfolios. These companies are truly changing the way we live and are generating exceptional profits. However, many investors are very short-term in their outlook. In its most recent quarter, Apple reported that it expects sales for its newest iPhones to be weaker than expected. As a result its stock fell precipitously. Even with a poor quarter, Apple should still generate an incredible amount of profits. A weaker than expected iPhone lineup should not change Apple’s trajectory. Apple is a much better company than it was a couple of years ago. It now generates over 30% of its revenues from its services business. Another prominent victim of the October market drama has been Facebook. The media is portraying Facebook as a broken company. Nothing could be further from the truth. Over 2.6 billon individuals use one of its platforms on a monthly basis and the company has yet to monetize its popular WhatsApp and Messenger programs. Facebook has taken major steps to improve its privacy and security and we believe that the negative headlines will fade. Companies like Google and Apple are among the most profitable enterprises the world has ever seen. They are sitting on hundreds of billions of cash and working on new products and services that will improve health care, media, transportation and communication. The valuations on some of these companies are extremely cheap given their expected growth rates. Our strategy in the face of market declines has remained consistent for over 25 years. In February of this year, the U.S. stock market sold-off on worries about a potential recession. The most recent drop is due to worries about interest rates rising too fast because the economy is too good. We believe that the North American economy is neither so good that interest rates will rise too far, nor is it so weak that a recession is imminent. Just as it has in the last ten years, we believe that the North American economy will continue its slow ascent and will suffer its usual fits and starts. We are moving ahead with the same cautious approach we have always taken. While we remain fully invested, we will stick to high quality corporations that have strong balance sheets, that generally have a history of raising dividends and that have a long runway of growth for their products and services. As a result of slowly rising interest rates, we are keeping bond maturities very short in the hopes that we will be able to earn better returns on fixed income going forward.